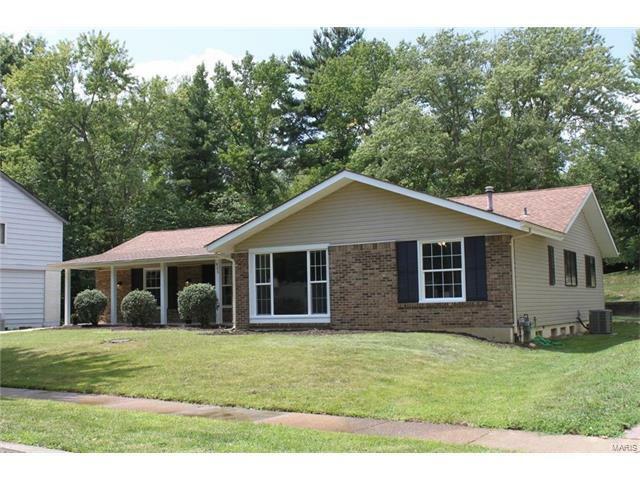 Sprawling OPEN FLOOR PLAN 4 bed 2 full bath ranch home with rear entry 2 car garage! MOVE-IN-READY home with high quality finishes in the highly desired Parkway C-2 School District. This home offers 42" kitchen cabinets, granite counter tops, stainless steel appliances including GAS stove w/griddle, new wood floors throughout majority of home, new carpet in all 4 bedrooms, wood burning fireplace, new ceiling fans and fixtures, fresh neutral paint, new baseboards, high efficiency furnace, newer a/c, recently waterproofed basement contains new lighting and tons of storage, new siding, many new windows, fresh landscaping and much more! The master bathroom en suite is complete with tiled floor, tiled shower surround, new glass shower doors and new vanity.